"It was a genuine pleasure to meet a Realtor that provides great service and human warmth." Located in downtown Steamboat Springs, Colorado, we have a passion about the outdoors and the experience to help you get the most of a visit to Northwest Colorado. We are the fly fishing experts. Our experienced, local guides can make your fishing outing a memory of a lifetime. So, give us a call. We'll tell you the best fishing spots. 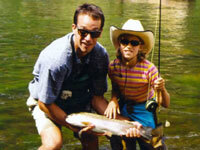 Steamboat Springs is blessed with some of the finest fishing opportunities in all of the Rocky Mountains. With the Yampa River flowing right through downtown, the Elk River only 30-minutes north and the Bear and Colorado Rivers to our south, fishing opportunities exist almost everywhere you look. We are fortunate to offer our guided fishing trips on a variety of public and private waters and will match you with the best possible fishing for any given day at anytime of the year. Our guides know fishing and are truly passionate about the sport. You will not only receive the appropriate level of instruction from your guide, you will also learn something about the Yampa Valley and Steamboat Springs, the conservation of our local fishery and come to understand why we choose to live in such a beautiful place. Allow us at Blue Sky West to help guide you, your family and guests on one of our rivers adventures. Our permits for white water rafting, fly fishing and river tubing on the Yampa, Colorado, North Platte, Eagle, Bear and Elk River will get you in the water and provide you a classic Colorado experience. the tail waters of Stagecoach Reservoir, Sarvis Creek Wildlife Area, Steamboat Lake, Colorado River, unbelievable private tail water of Lake Catamount, or the extremely scenic Buffalo Creek Ranch. All your gear (except flies and licenses) can be provided at no additional cost, or use your own. If you like to fly fish or always wanted to learn, we can provide a fishing trip you will always remember. Steamboat Flyfisher was created in 2005 with the purchase of the Steamboat Fishing Company and its move to 507 Lincoln Avenue. The experienced staff can equip you and give you the information necessary to make your fishing trip a memorable experience.